Every summer, the Fancy Food Show brings specialty food vendors from all over the world to New York’s capacious Javits Center. The sheer number and variety of products on display is mind-boggling, from maple syrup to jerky and from popcorn to pasta. There are aisles full of condiments, jams, jellies, and veritable mountains of olives. Cheese is also well-represented, including the many fine cheeses produced in New York State. While I enjoy nothing more than grazing my way through the American Cheese Society booths, my focus at the show is usually on products that make life easier for people following various alternative eating lifestyles. Can’t drink cow’s milk for some reason? I’ve sampled plenty of non-dairy milks over the years, as well as the milk of goats and camels. Yes, camels. Purveyors of non-sugar sweeteners dot the Javits Center’s carpeted landscape, as do substitutes for both meat and wheat. There’s something for every type of diet, whatever the restrictions. One of my favorite products at this year’s show was Tio Gazpacho. I must admit I’m a bit of a gazpachoholic and can eat it every day, but I’m not into making it at home very often. Enter Tio, a bottled chilled soup that owes its deliciousness to chef and humanitarian José Andrés, who crafted each flavor. 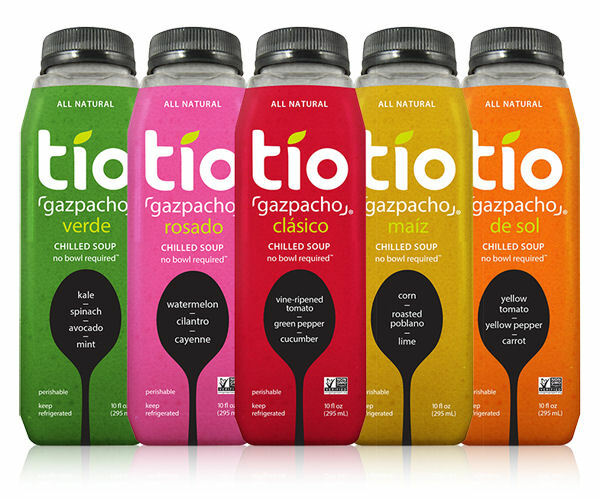 Tio Gazpacho is made from real ingredients like carrots, tomatoes, sherry vinegar, and extra virgin olive oil, and is certified organic, non-GMO, vegan, and gluten-, dairy-, and soy-free, plus four of the five flavors are Whole30 approved. I love that I can tuck a bottle into my lunch bag and enjoy my fave soup every day. Available: Gourmet Garage, Whole Foods, and Amazon. In another aisle, as I was attempting to shovel a sample of chamomile tea-flavored ice cream into my mouth (I’m currently on the Ice Cream Diet, my own creation), I was interrupted by a group of French guys hawking mayonnaise made with microalgae. It’s hard to find non-soy mayo that tastes good. I’ve tried the ones with avocado oil and nuh-uh, they don’t work for me; let’s say I was skeptical about the algae stuff. But after a few spoonfuls, I was convinced. I swear it tastes like homemade, eggy, mayo, yet it contains no eggs. No eggs means less fat, but that also makes it vegan. Who knew lowly microalgae could be transformed into something that doesn’t taste like, well, algae? 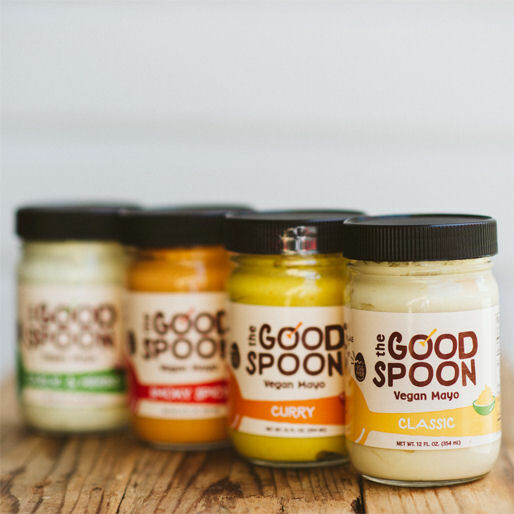 The Good Spoon Mayonnaise comes in classic, curry, garlic & herbs, and smoky spicy flavors, all great in everything from potato salad to a turkey sandwich. And it’s available in 100 stores in the NY city area. And Paris, too, if you’re lucky enough to be there. Available: Brooklyn Fare, Morton Williams, and many other locations in NY. There are squillions of non-dairy milks out there, but dairy-free creamers that aren’t full of sugar are as rare as hen’s teeth. You might think: why not just use plain unsweetened almond milk? Have you tried doing that? It takes far more “milk” to adequately lighten a cup of coffee or tea to the same degree as a few teaspoons of cow-based half-and-half. All that liquid also makes hot coffee cold. That’s why I was excited to find Nutpods. 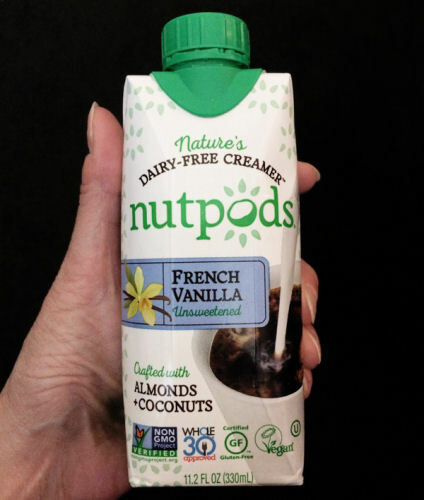 Made from coconut and almonds, it only takes a tablespoon or so of Nutpods to make my coffee as light as I like. It also comes in flavors, all of which are unsweetened. Vanilla is tasty year ‘round, but the holiday season will bring Pumpkin Spice and Peppermint Mocha, too. Available: LifeThyme Natural Foods and Amazon. When I am trying to lose a pound or ten and embark on some new eating plan that requires me to give up my three favorite food groups (sugar, grains, and dairy), I find breakfast and lunch a bit hard to deal with. I can’t have oatmeal or cereal, but I can have eggs if I don’t eat toast. Definitely no doughnuts or bagels. What I find myself relying on, especially during the work week, are snack bars. 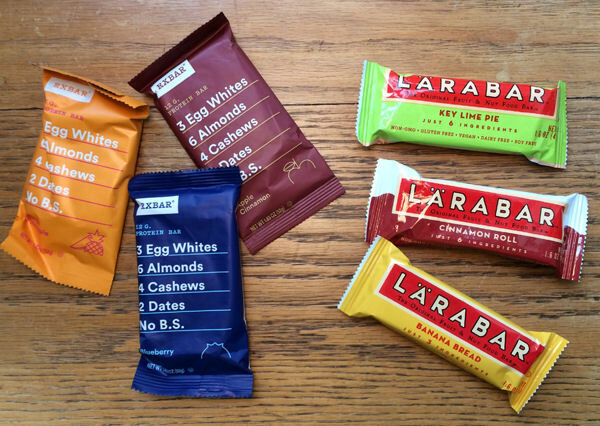 RX Bars are my favorite, followed by Larabars. They’re both made with fruit and nuts, with natural sweetness provided by dates. RX Bars have a chewier texture, thanks to the addition of egg whites, while Larabars are softer. Each has 200-ish calories, which is plenty to keep me going for a few hours. I think they taste great, and eat one for either brekkie or lunch most days. RX is also branching out into single-pack nut butters, another useful and easy protein-y snack for tossing into a purse or gym bag.